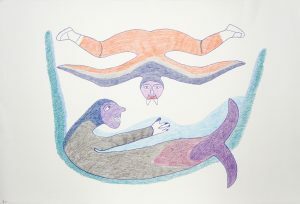 Irene Avaalaaqiaq Tiktaalaaq comes from a generation of artists who, after living a traditional life on the land, settled permanently in Qamani’tuaq (Baker Lake), Nunavut. 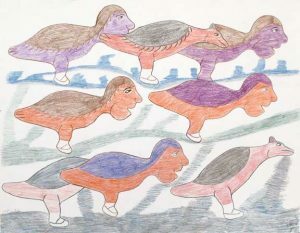 Her detailed drawings and brightly coloured wall-hangings often contain references to this heritage. 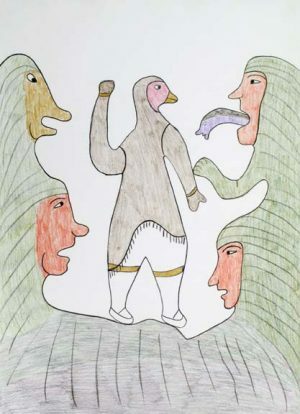 Avaalaaqiaq began her artistic career by creating small sculptures and drawings during the 1960s. Eventually she joined the printmaking studio, not just creating her own images but also printing them herself. 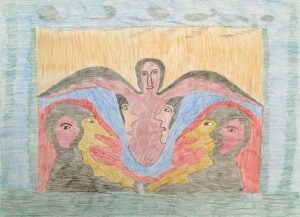 She is, however, best known for her unique style as a textile artist. 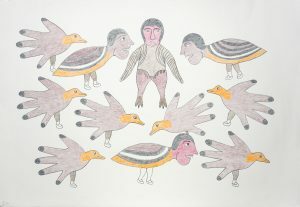 Working with appliqué and embroidery, Avaalaaqiaq creates a world filled with spirits and transformations, often based on stories and legends that she heard from her Grandmother when she was younger. 1999 Presented with honorary degree of Doctor of Laws by the University of Guelph. 1993 Attended the opening of the Northern Lights exhibit in Baltimore, where she spoke about her life and work as well as demonstrating embroidery and applique techniques. 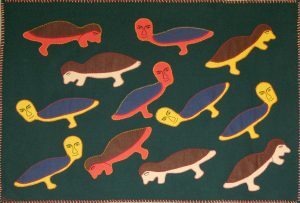 1979 A wallhanging by Avaalaaqiaq was presented to the State of Minnesota by the Canadian Ambassador to the USA; installed in the State Legislature in Minneapolis. 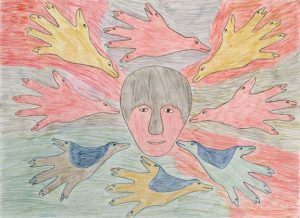 1973 Received a Canada Council travel grant to attend the opening of her first solo exhibition at the Innuit Gallery of Eskimo Art in Toronto. Bouchard, Marie. Irene Avaalaaqiaq. In “North American Women Artists of the Twentieth Century: A Biographical Dictionary”. 1995.